← Congratulations to Plain and Simple Quilt Shop! After working on those Civil War blocks, I decided to try something different. I was at Jo-Ann Fabrics last week and saw their Hawaiian print fabric on sale for 50% off. 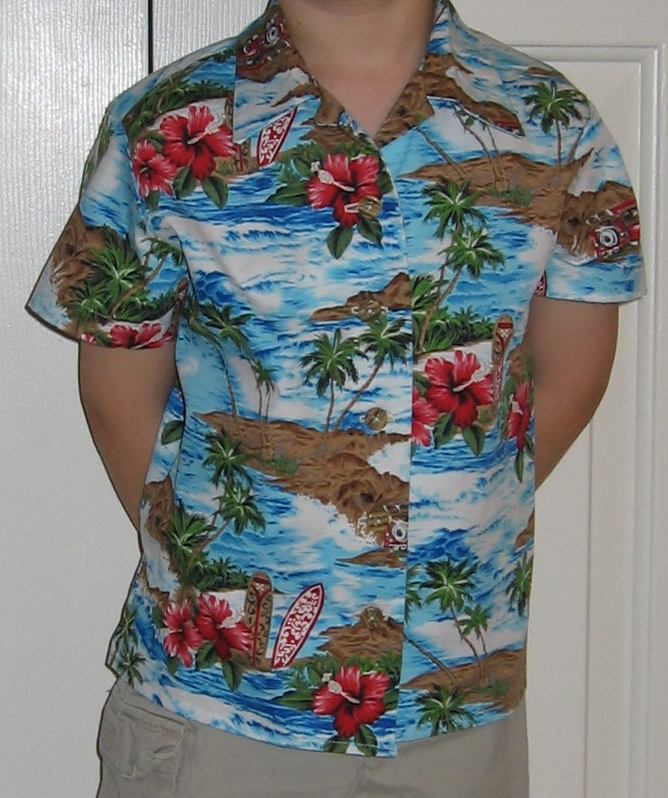 In a fit of inspiration (or insanity) I thought it would be a great idea to make matching Hawaiian shirts for my son and husband. I’ve haven’t done much garment sewing and was second guessing this decision after I got home with all the fabric and the pattern. I started with my son’s shirt – I figured since it was much smaller that if I made mistakes it wouldn’t be as big a deal to fix them. The shirt was finished over the course of two days and I am very pleased with the results! I used a Simplicity pattern and followed the directions exactly, even when I didn’t quite understand what I was doing. I had some issues with the collar, but when I just followed the directions instead of trying to overthink it, it turned out exactly as it should. The buttonholes were a snap since my machine has an automatic buttonhole maker. The great thing is, you can input a buttonhole size and it will then create as many buttonholes as needed that exact same size. Now I just have to make my husband’s!